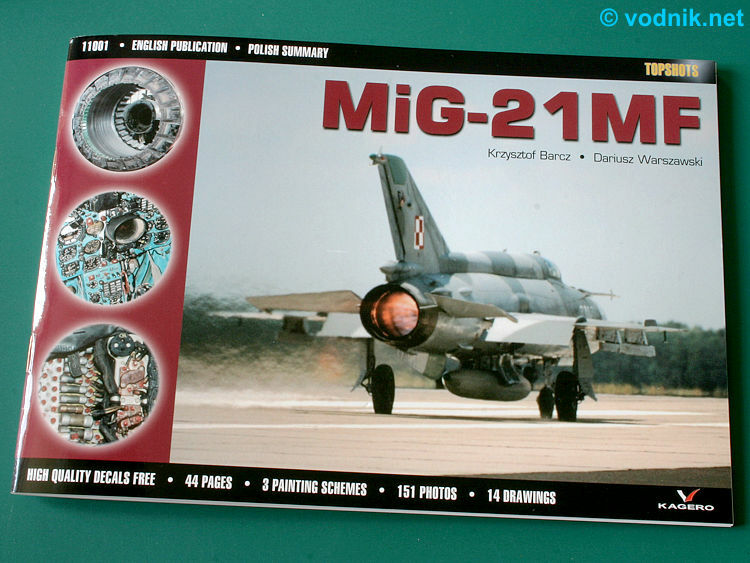 With the MiG-21MF book Kagero Publishing started a new series targeted at modelers: TOPSHOTS. Books in this new series are printed in a convenient 16.5 cm x 23.5 cm format (won't take much precious space on our modeling workbench), are printed in full color, with English main text, bilingual (English/Polish) photo captions and all include decals printed in a few most popular scales. 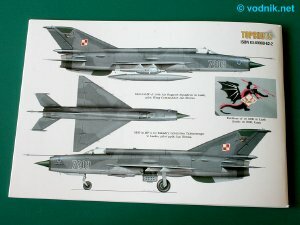 The MiG-21MF book contains 40 pages filled with high quality color photographs (151), but also includes about 14 drawings from technical manuals and 3-view color plate of one camouflaged aircraft from Polish 10 ELT (Autonomous Tactical Air Support Squadron). The information on the cover is a little bit misleading, as it is indicated that the book is English publication with Polish summary, while in fact only Polish texts is included in the form of photo captions. Introductory paragraph on the first page is printed in English only and includes basic information about the aircraft, its different variants and history of service of the type in Polish Air Force. Other misleading information on the cover is text: "3 painting schemes". I don't know what was the intention of the author of this text, as there is only one color plate for one camouflage scheme included and decals allow to build a model in one of two painting schemes. Photos in the book show Polish Air Force MiGs in five different painting schemes, although the colorful "tiger" scheme is only barely visible on one photo of the tail fin parachute housing. Click on a photo to zoom. The book starts with several overall photos of Polish single and two-seat MiGs in various painting schemes. Next are very good quality shots of all airframe and engine details. Cockpit, ejection seat, radar, antennas and probes, avionics bays, speed brakes, access panels, tail fin, landing gear and bays, engine, engine bay, cannon, pylons and missiles are all shown on many clear photographs. Noticeably missing are any photos of wings, control surfaces and horizontal stabilators - strange omission considering the attention to all other airframe parts visible in the book. On page 7 we get very small table with only the most basic technical data on MiG-21MF aircraft. 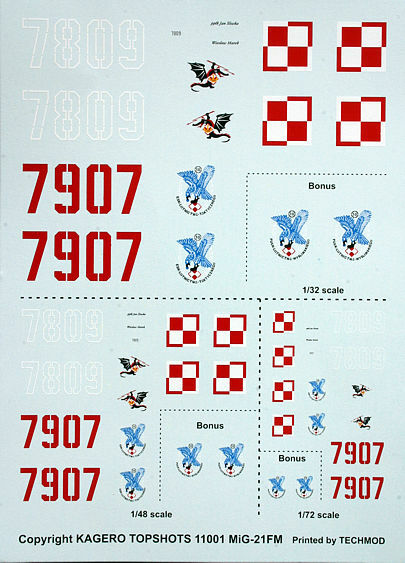 As mentioned earlier the book contains (on the back cover) one 3-view color plate of 10 ELT aircraft (number 7809) and included are decals for this particular machine in three most popular scales: 1/72, 1/48 and 1/32. In addition to markings for this plane camouflaged in 3 shades of gray with white outlined 7809 numbers, we also get the second set of 7809 numbers printed solid in red and these can be used to build this same machine in earlier overall silver (or was it light gray? - there is no information about the color of this plane given) scheme shown on one photograph in the book. The only problem is that colors shown on the color plate are not named or referenced to any standard colors system, so modelers must match colors themselves using included photos as reference. Decals are printed by Techmod and are in perfect register with very nice details on squadron's dragon and eagle insignias. 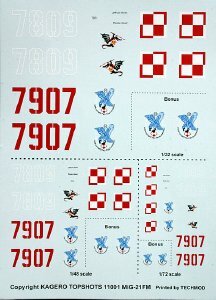 Decals only include basic markings and no data and maintenance stencils whatsoever. This means that quite noticeable "NATO-standard" triangular grey ejection seat warning markings under the canopy are not included (and not shown on color plates). Also not included on decals (nor on plates) is a small "10 ELT" text visible on photos under the Polish checkerboard insignia on port side of the tail fin. And one more thing worth mentioning - the Polish white and red checkerboard is printed on the decal sheet with the red square on top left corner. Such orientation of the insignia was correct during most of 70 years of Polish aviation history until early 1990s when Polish parliament (to the high discontent of most Polish aviation historians and enthusiasts) changed it to currently used form with white square in top left corner and all planes shown in the book carried new standard markings. Of course in case of decal it is only a matter or rotating them 90 degrees before application to proper orientation, but it is something that modelers must remember to do. New Kagero series of photo monographs should be very welcome by all modelers and inclusion of high quality decals makes them even better. 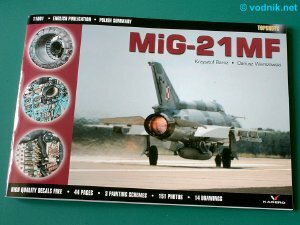 MiG-21MF book should be on the shelf of every modeler planning to build a model of this aircraft. While there are some omissions in the book, overall it presents the plane in excellent detail and shows that the TOPSHOTS series is definitely worth atention. Many thanks to Kagero for the review sample! Kagero books are distributed in the US by MMD-Squadron.